Reaching Resolution is helping the members of our community to flourish. Serving toddlers to grandparents, and everyone in between, our diverse team of professionals can help you find solutions to the problems you and your loved ones face. With over 20 years of experience, we continually grow our specialties to best serve clients and offer services for the whole family. We have weekday, evening, and weekend appointments to meet our clients' busy schedules, as well as telehealth for those wanting real-time assistance while in their home or office. Dr. Tracy Masiello is the founder of Reaching Resolution. She holds a doctorate degree in psychology, with concentrations in counseling and developmental psychology, as well as is a Licensed Professional Counselor and a Licensed School Counselor in North Carolina. She is also a Superior Court and District Court Mediator, certified by the State of North Carolina Alternative Dispute Resolution Commission. In addition, she is a certified Parenting Coordinator helping couples involved in high conflict custody and divorce cases. Tracy works with young children through adults, and is highly specialized in providing interventions for children with Oppositional Defiant Disorder, Attention-Deficit/Hyperactivity Disorders, and Autism Spectrum Disorders. She is a nationally certified Parent-Child Interaction Therapist (PCIT). In addition to her work with clients, Tracy conducts research on effective strategies for strengthening family relationships and promoting healthy child and adolescent development. As the recipient of several federal research grants, the findings from her studies have been extensively published in professional journals, books, and reviews. She serves on the editorial board for the Journal of Social, Behavioral, and Health Sciences, and is a peer-reviewer for the Association for Play Therapy's Play Magazine. She is a member of the American Psychological Association, the American Counseling Association, the Association for Play Therapy, and the North Carolina School Counselor Association, as well as is an associate member of the North Carolina Bar Association and the American Bar Association. Shannon Freeman is a clinical therapist at Reaching Resolution, working with older children, teens, adults, couples, and families. Shannon has extensive experience in helping her clients manage feelings of stress, anxiety, or depression, and develop emotional control. She also is highly specialized in providing co-parenting counseling for couples who have experienced separation or divorce, and has extensive experience in helping children and families navigate the challenges that come with having two homes. In addition, Shannon holds the Certified Family Trauma Professional (CFTP) training certification, helping those who have experienced trauma to find the path to healing and resilience. Shannon also provides counseling for couples and families to strengthen their relationships and improve communication. Before coming to Reaching Resolution, Shannon was the lead clinician for the Intensive In-Home Child and Adolescent Psychiatric Service developed by Yale University Child Study Center. From this experience, she brings a wealth of expertise in working with children and teens with ADHD and challenging behaviors. She is a member of the American Association of Marriage and Family Therapy. Shelby Holland is clinical therapist at Reaching Resolution, working with older children, teens, adults, and couples. She is effective at helping children and adolescents feel less anxious or depressed, increase their sense of happiness and motivation, and improve behaviors at home and at school. She also has extensive experience helping adults to manage stress, anxiety, and depression. She specializes in working with adults as they navigate their way through life changes and figure out next steps for new life directions. Shelby holds certification in Ecosystemic Structural Family Therapy, which takes a holistic approach to helping families, recognizing that the child, parents, and the marriage relationship are interconnected and important for healthy family functioning. Eve Rogerson is Master's level mental health counseling intern from Northwestern University. She is experienced in helping adults manage depression, anxiety, and stress, as well as helping those who have experienced trauma. In addition, she has training and experience in working with adults with personality disorders. Eve is an experienced crisis counselor with a long history of working with non-profit organizations and is passionate about promoting mental wellness. Eve holds a Bachelor's degree in Psychology and a Master's degree in Teaching. Prior to respecializing as a Mental Health Counselor, she taught Psychology in England, and worked as a program assistant within International Programs at UNC Charlotte after moving to North Carolina in 2011. In addition to her clinical training and work with clients, Eve is a dedicated advocate for suicide awareness and prevention. She currently serves on the Board of the Licensed Professional Counselors Association of North Carolina (LPCANC) as the Graduate Student Representative. 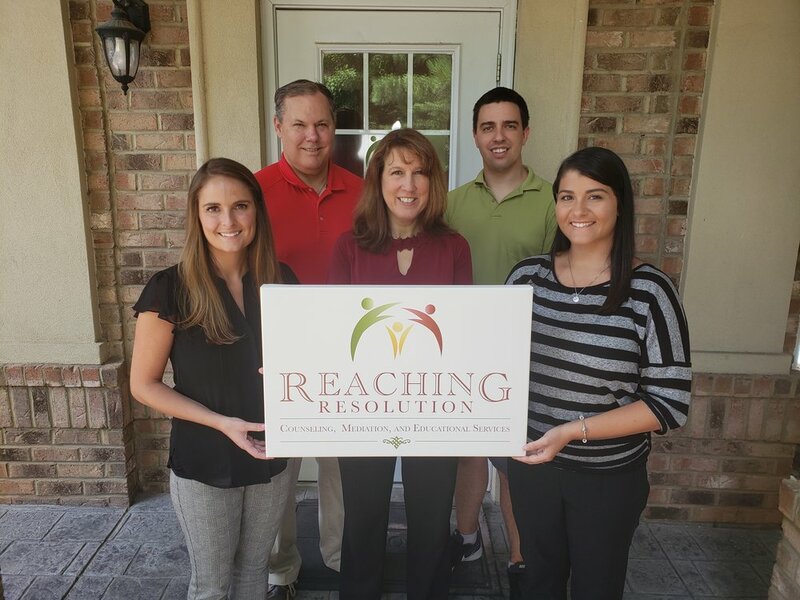 Scott Brown oversees the tutoring and educational testing services at Reaching Resolution. He is a licensed teacher in the areas of Math and STEM in North Carolina for grades K-12. Scott has been a teacher in both the Charlotte Mecklenburg and Cabarrus County School Districts. He previously served as the Executive Director of Charlotte STEAM, a non-profit organization promoting hands-on STEM and arts learning in schools, as well as is the founder and director of the Agent Einstein STEM summer camps in Charlotte. Jax is a two year old English Golden Retriever who is certified in the state of North Carolina as a service dog, and is registered with the American Kennel Club (AKC) as part of a therapy dog team with Dr. Masiello. Jax enjoys helping with play therapy, watching puppet shows, being the patient for child doctors, and performing his part, in costume, in children's role-plays.